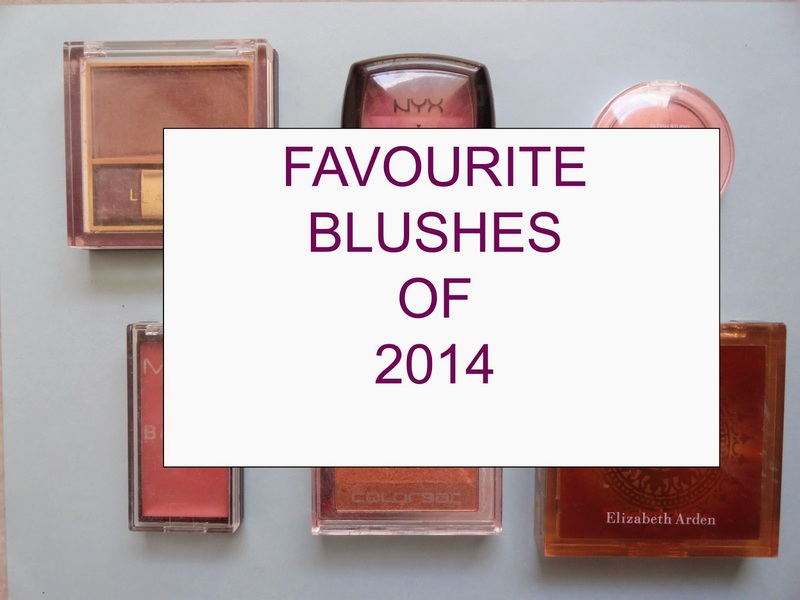 When I started blogging in 2011 there were no fashion blogs that focussed on Indian wear. There were no fashion gurus online to show multiple ways to style a sari or how to accessorise it to look different every time. But I did have a lot of offline inspiration and that is why I started the blog. My colleagues (I was working in a school at that time) were always well dressed and this one particular teacher, the biology teacher, inspired me to dress better. Her blouse designs were creative and all original, because she was her own designer. Today's post in a way is dedicated to her because not only she did make me fall in love with the whole 6 yards, but she made me appreciate it and showed me that the sari was anything but boring. IshtyleAwhile started because of her encouragement and her blouse designs. 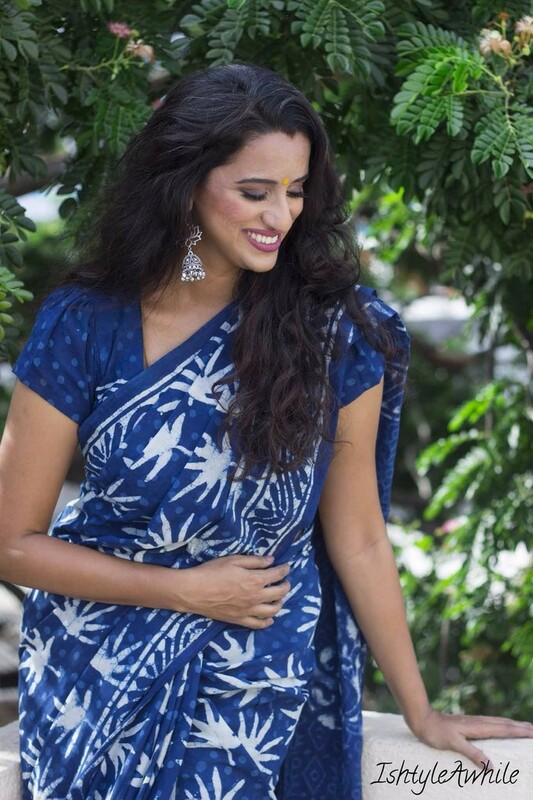 Today I am styling a a simple cotton indigo sari in 2 different ways. Both the blouses were designed by Manjeri of Cognac designs. The original blouse that came with this sari has small polka dots and was the same as the body colour of the sari. Monotones is coming back in trend and though some might find it super boring to wear matching blouse and sari, accessorising it with a statement pair of earrings, like these ones from Fida Jewellery, gives a break to the monotony. 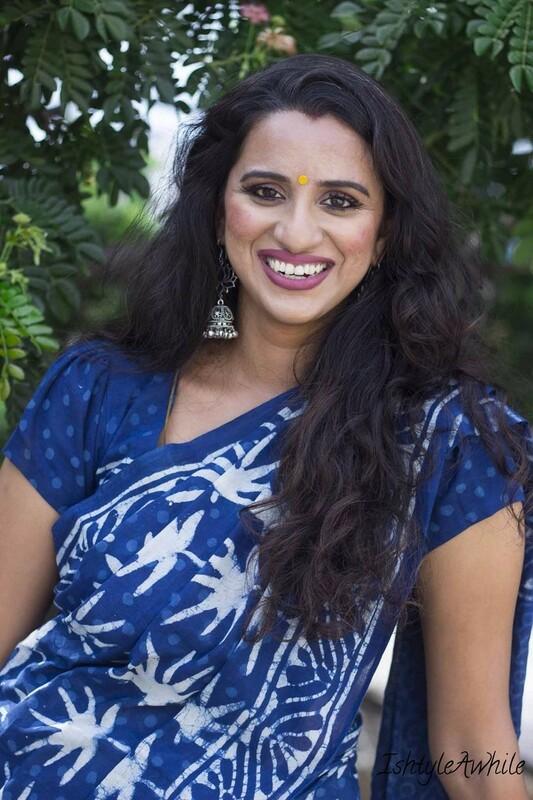 I loved the casual vibe of this sari and let me tell you, it is just perfect for summer. Comfortable and elegant. 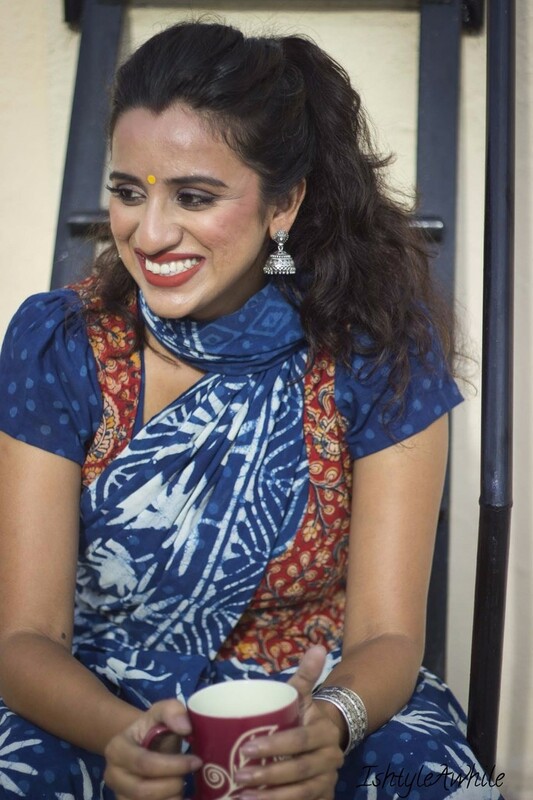 When I bought the sari from Parikatha, it came with another blouse which had kalamkari work. Now I definitely wanted to have 2 blouses for the same sari to be able to give a different look every time. So while Manjeri and I sat to brainstorme different ways to have an alternative blouse option, she suddenly remembered that I had wanted a vest look for a long time. And just like that I had a vest to pair with this blouse or any other blouse for that matter. Adding the extra layer just changed the entire feel of the sari, and I definitely wanted to go for a more edgy look. Hence the pallu got wrapped around the neck like a stole, the hair got thrown into a high pony, and I added a hip belt just for fun. The jhumkas are from Aadvikas and since I had the pallu like a stole, I skipped out on wearing a neckpiece. Notes from the designer- Indigo has always fascinated me because of how difficult it is to extract the dye from the plant and also the fact that it is among the only natural dyes that cannot be made a fast colour, indigo is by all means a colourful rebel. This was my inspiration for the blouse design. I wanted the design to be fluid, playful, interchangeable and rebellious. 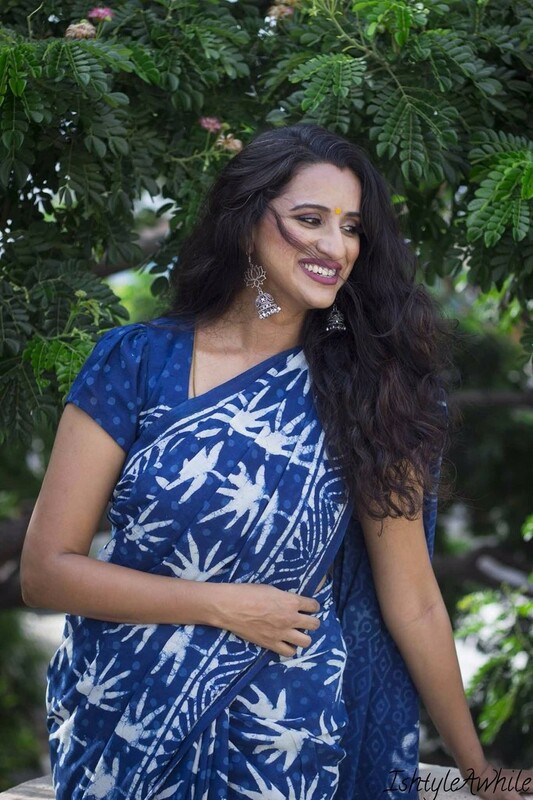 The kalamkari sleeveless button-up vest and blouse combination give the option for the saree to even be worn as a skirt too or styled multiple ways. Without the vest, the blouse in itself is a young design with wispy ties, puff sleeves and necklines that accentuate krupa's delicate features. Well there you have it guys, one sari styled with 2 different blouses. I have done a post similar to this before where I styled a black bandini sari in 2 ways. I had the best time working with Anitha, the makeup artist. She did a stunning job and of course it was not my first time working with Poornima, who is always amazing with the camera. And a huge shoutout to Manjeri for always designing the best blouses for me. There are more posts coming up in collaboration with her. Disclaimer- None of this was sponsored. The blouses, the sari were all paid for. Only the Fida earrings and Aadvikas Jhumkas were sent to me by the brands.